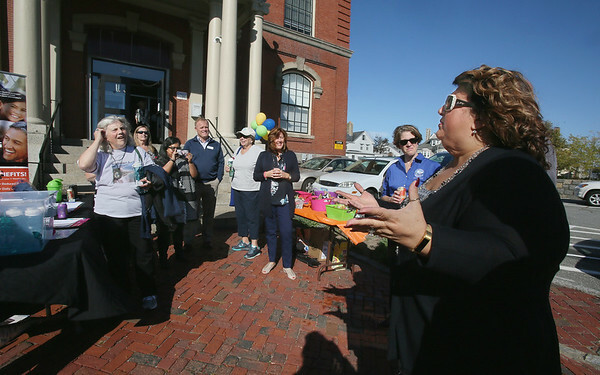 Mayor Sefatia Romeo Theken, right, gives a pep talk outside Gloucester City Hall on Thursday to city workers who have pledged to take regular walks to promote health and productivity. The walking initiative is a parnership between the Gloucester Health Department, which received a grant from the Massachusetts Department of Public Health, and the Cape Ann YMCA, which is administering the program. At the event Thursday, the YMCA provided water bottles, pedometers, walking maps, healthy snacks and information materials. Participants have vowed to take daily 15-minute walks together during lunch breaks and after work, and to use the nearby YMCA facilities when the weather is bad.